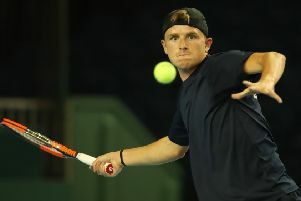 Aidan McHugh is looking to use his Wimbledon success as springboard - and emulate hero Andy Murray by one day winning the title. The Bearsden youngster turned in two terrific performances to get to the last 16 of the Junior Singles. Firstly he overcame dehydration sickness during his first round match with America's Gianni Rossi to win 6-2 2-6 6-4. And he then knocked out number six seed Marco Mildanovic from Serbia, storming through the first set 6-0 and then taking the second 7-6. The 17-year-old's run came to an end in the third round when he lost 6-3 6-7 6-2 to France's Matteo Martineau. Aidan also got the chance to hit with Andy Murray in a practice session before the tournament began. Both Andy and brother Jamie regularly encourage Aidan and other developing young Scottish tennis stars in the hope what they have achieved will rub off. Aidan has said his dream is one day to play in - and hopefully win - and dad Chris says this year's experience at SWQ19 can only do him good. He said: "It’s been great being around Jamie and Andy and seeing how they do it and how they speak. “They’ve been very nice to Aidan - very friendly and very helpful.